Yesterday the government began placing bags of Fukushima topsoil contaminated by the March 2011 nuclear accidents into an "interim" storage facility near the crippled Fukushima Daiichi complex. The Environment Ministry plans to move the contaminated soil — currently being kept at more than 75,000 locations in the prefecture’s 43 villages, towns and cities — to the facility gradually. Work to remove the soil, seen as an impediment to reconstruction efforts, has finally been launched. The construction of the facility is planned in a coastal area of about 1,600 hectares that straddles the line between the towns of Okuma and Futaba. The facility, which is designed to prevent leaks of radioactive substances, is capable of storing up to 22 million cubic meters of soil and other radioactive waste for a maximum of 30 years. Ten million cubic meters? In a "trial run"? In a year? 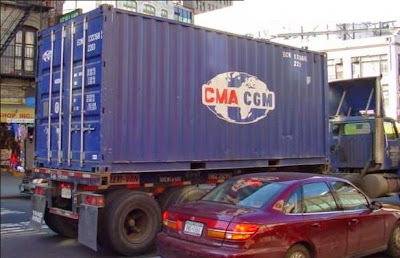 Folks, to give some sense of what they are talking about doing, the standard 20 foot shipping container on the back of the truck in the below photograph is 33 cubic meters -- and that is outside dimensions, not what you can actually pack inside. That means, just doing the math roughly, 304,000 truckloads of the above size, 830 truckloads every single day (no holidays), will arrive and be unloaded at the site -- in a year. Something is seriously wrong with these numbers. If not, something is seriously wrong with the folks in charge. It gets worse. In the highly redacted online Japanese version of this article, the 12 bags (~12 cubic meters) of topsoil deposited in yesterday's opening ceremony were brought to the site in two dump trucks. At that rate it would take 1.7 million truck trips to transport the 10 million cubic meters of soil from the current short-term storage sites to the "interim" site. 1) "Soil transfer to interim storage begins / Major step in recovery of Fukushima." The Japan News, 14 March 2015.